“Forbes” magazine has hailed Agentdesks — a startup by two Carnegie Mellon University alumni — as one of “8 Real Estate Startups to Watch” because of its powerful, innovative app for today’s real estate agents. The app serves as a mobile workstation allowing residential Realtors to simplify their workflow and more effectively manage relationships with other Realtors and their clients. Ashokan earned his CMU master’s degree in 2007 in Information Systems Management, a multidisciplinary degree from the Heinz College of Information Systems and Public Policy that offers a unique blend of technology, management and strategy. He cofounded Agentdesks with Chief Operating Officer Sanya Gurnani, who earned her undergraduate business degree from CMU’s Tepper School of Business in 2009. “Biju and I met on a CMU service trip, and from day one we talked about wanting to start something together. When Biju came up with this idea, I didn’t need too much convincing to jump on board. With his experience in product and engineering and my experience in operations and strategy, we knew it was the perfect fit,” Gurnani recalled. Agentdesks was seeded by the prolific startup incubator AngelPad in late 2014 and has aspirations to grow fast and large. “There isn’t anyone out there that acknowledges Realtors as each other’s peers, not competition, and allows them to effectively share one another’s clients’ needs seamlessly to close deals. The response has been phenomenal and we’ve only just started,” Gurnani said. Zach Conley of Boston-based Boardwalk Properties is a proponent of Agentdesks. “My business has skyrocketed over the last year and I have Agentdesks to thank for it. All my real estate contacts are in one place, and I never forget to follow up anymore,” Conley said. Cindy Parker Martinez of Sand Dollar Realty concurred. 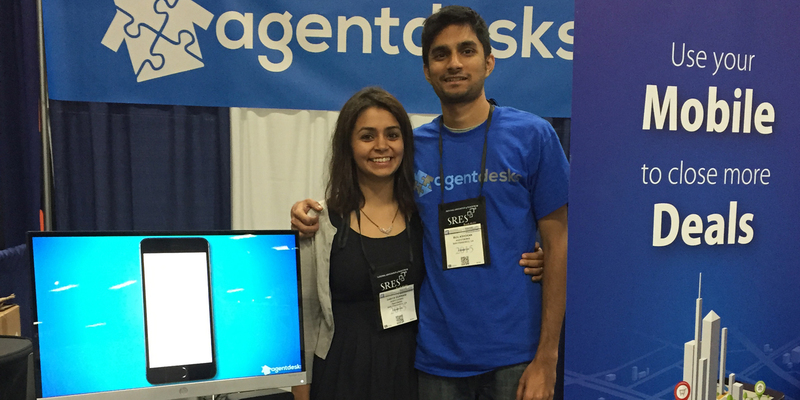 “Agentdesks helps me quickly store leads on my phone, set follow-ups and keep track of clients, conversations and business,” she said. Big players are on board with the product as well. Agentdesks works with Zillow, and Council of Residential Specialists (CRS), which provides the highest credential awarded to residential sales agents, managers and brokers. In addition, Agentdesks features a clientele that includes agents from industry powerhouses RE/MAX and Coldwell Banker. Capital investors in Agentdesks — Tim Guleri of Sierra Ventures and Gokul Rajaram, an angel investor — laud the team of Ashokan and Gurnani for their technical knowhow, savvy business instinct, superior people skills and their ability to accept feedback with little regard for ego. Agentdesks has caught the eye of the trade press, having been featured in publications including Real Estate Tech News, Inman News and TechCrunch, in addition to Forbes. From the outset, Ashokan and Gurnani have been confident in Agentdesks potential. “Carnegie Mellon gave us all the right tools to start and run a company,” Ashokan said.